That still doesn't mean it's for everyone. BlackBerry's first Android phone was a curious, ambitious machine, so it's funny that the company's second turned out to be so ... practical. The $299 DTEK50 is affordable from the get-go, lacks a physical keyboard and was basically tailor-made for corporations to buy in bulk. Seriously: BlackBerry has been pretty candid about the fact that this is a "fleet" device, a supersecure phone it hopes will attract companies trying to trick out their mobile workforce. BlackBerry is trying to pitch this to regular people too, though, and in the process, it's hurling the DTEK into a crowded, crazy-competitive pool of midrange phones. Spoiler alert: It's probably not for you. BlackBerry's second attempt at an Android smartphone lacks the ambition of last year's Priv, but don't get hung up on that. 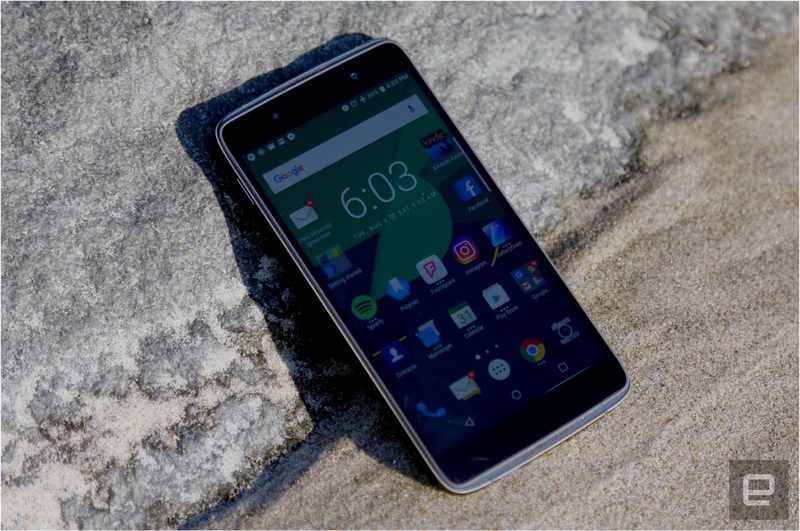 The DTEK50 is a solidly built device with a super-secure foundation, and the company's take on Android continues to impress. Still, the competition among mid-range phones is fierce, while the DTEK50 has its share of rough edges. Think: underwhelming battery life and sometimes pokey performance. Altogether, the DTEK50 is a respectable phone that will have a hard time standing out to people who don't really care about security. 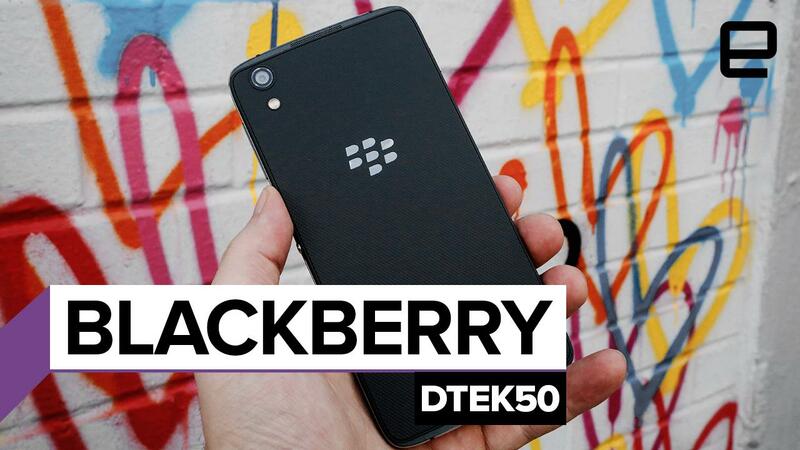 If you're reading this, there's a good chance you already know BlackBerry didn't design the DTEK50 by itself. 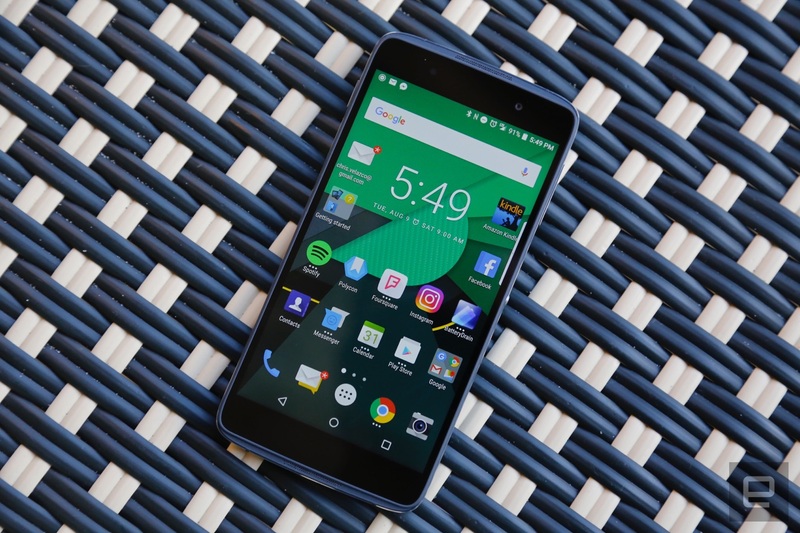 Instead, the company chose a reference design from TCL -- the folks behind the Alcatel brand -- that offered the level of performance it was after. That decision was... divisive, to say the least. CEO John Chen has long said that BlackBerry would stay in the hardware game as long as there was money in it, and by customizing an existing design, the company just saved heaps of money on product development. The flipside is that the finished device doesn't really feel like a BlackBerry. I'll be the first to admit that sounds a little silly, but still, I was a little worried when I first heard the news. BlackBerry has historically taken pride in designing its devices, from pint-size beauties like the Pearl series to last year's delightfully bonkers Priv. Pulling an existing design off a shelf and adding BlackBerry accents like a logo and a textured rubber back didn't sit right with me at first, even though the company maintains it's a pretty common practice. Ultimately, though, it's safe to say that these concerns only really matter to mobile wonks like me. Once I got down from my high horse, I was met with a device that's respectably well built and even sort of handsome (in an understated sort of way). The company also says the DTEK50 is the thinnest BlackBerry ever, which helps explain the mediocre 2,610mAh battery squeezed in there. I'll dig into that a little later; for now, just know that the DTEK50 manages to be very light without ever feeling cheap. Nice work, TCL. Unlike last year's premium Priv, we're working with a midrange list of specifications: an octa-core Snapdragon 617 chipset with 3GB of RAM and an Adreno 405 GPU. Alas, there's no physical keyboard this time; you'll be typing your messages on a 5.2-inch, 1080p IPS LCD touchscreen. Flanking the display is a surprisingly capable pair of stereo speakers, an 8-megapixel front-facing camera and a notification LED up top. But don't get too excited, BlackBerry loyalists: It only blinks white. Meanwhile, the DTEK50's backside is home to a 13-megapixel camera (with phase-detection autofocus, no less) and a two-tone LED flash. In fact, the only time the DTEK50's display seems to fall short is when you look at it next to other devices that cost about the same. ZTE's Axon 7 will cost only $100 more when it launches in the US in September, and it features a beautiful Quad HD screen. Would it have been nice to get a higher-res screen on the DTEK50? Sure. Would it have made any sense, considering BlackBerry is trying to sell these en masse to businesses? Not even a little. The audio quality another pleasant surprise, given that BlackBerry has never paid much attention to it in the past. I always feel a little twinge of giddiness when a phone I'm reviewing has stereo speakers, and the DTEK50's offer crisp highs and decent channel separation for immersive sound. Even better, the speaker setup is replicated on the phone's back so the jams won't stop even when the DTEK50 is lying face down. Still, they're far from perfect: Most songs I tried sounded hollow. What's more, the DTEK's maximum volume isn't terribly loud, though it'll do fine for podcasts and YouTube videos. 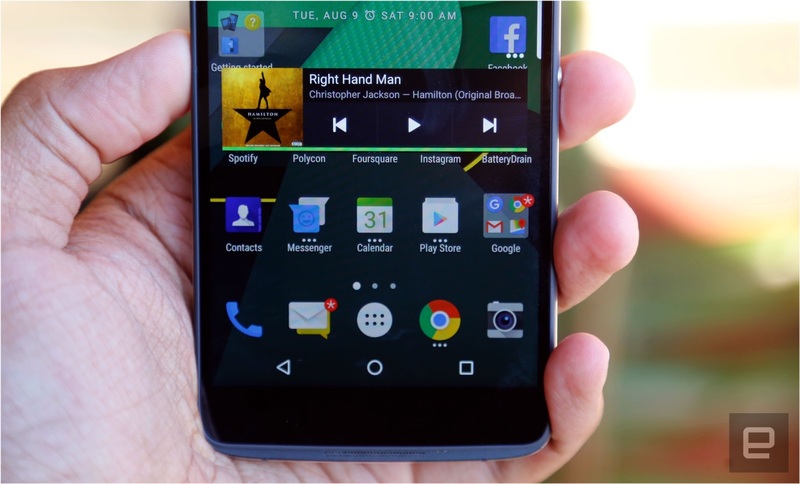 The DTEK50 also comes with Waves' MaxxAudio tuner, but your mileage may vary. The app's presets usually succeeded in making my songs sound different, but not necessarily better. Now that the company is willing to almost completely outsource hardware design and production, BlackBerry's soul boils down to two things: software and security. Unless it nails both of those things, then, there's little reason to buy into the company's vision. As far as the former goes, there's no point in hiding it: I dig BlackBerry's take. Things haven't changed dramatically since the Priv's days -- the company didn't mess with Android 6.0.1 itself. Most of the same tricks are back and they still focus on getting things done fast. Meanwhile, peer closely enough at the screen and you'll see the edge of a tab all the way on the right. Swiping on that opens the Productivity tab, where you'll find a rundown of the day's calendar events, unread messages, tasks that need completing and favorite contacts (you know, just because). Just like Samsung's Edge UX, it's easy to forget the feature even exists, but it's handy when you do remember it's there. If that wasn't enough swiping, you can view an app's widgets in a pop-up window (as opposed to finding room for them on your home screens) by swiping up on them. It's a neat touch that gives you extra context without having to fully open the app, but I never really use widgets in the first place. That swiping continues when you use BlackBerry's software keyboard. Fan that I am of Google's in-house keyboard, I love what BlackBerry has come up with: It's perfectly sized, it's precise and swiping up on word suggestions to complete messages is actually pretty fun. It's easily one of the finest keyboards available on an Android phone, which is only natural considering the company that made it. Curiously, though, one of the BlackBerry's neatest software touches didn't make the leap here: You can no longer set a Picture Password, which is puzzling because it worked fine on the Priv. Obviously, the DTEK50's biggest selling point is security, and I haven't dwelled on it until now is because it's almost completely invisible to the person using the phone. You can't tell that a hardware root of trust was baked into the phone during manufacturing, just like you can't tell the phone is fully encrypted by default. The only real reminder that the DTEK50 is more locked down than most is the namesake DTEK app, which offers an at-a-glance look at how secure the phone is. But here's the rub: DTEK is what you make of it. You'll get a rating and a checklist of things that are or aren't going well on the phone upon launch, but after you take basic precautions like setting up a PIN, the app mostly just says everything is excellent. It's when you dig a little further that DTEK's value really becomes apparent -- it outlines which apps have access to certain parts of the phone and counts up how many times those apps try to gain access. As of this writing, for instance, Facebook Messenger has tapped into my device's contacts nearly 500 times. In certain cases, you can even see where you were when an app tried to gain access. More important, permissions can easily be revoked and apps can be quickly uninstalled from within DTEK, making it yet another one-stop shop for functions that would normally be buried in settings menus. I wasn't expecting much from the DTEK50's 13-megapixel camera. 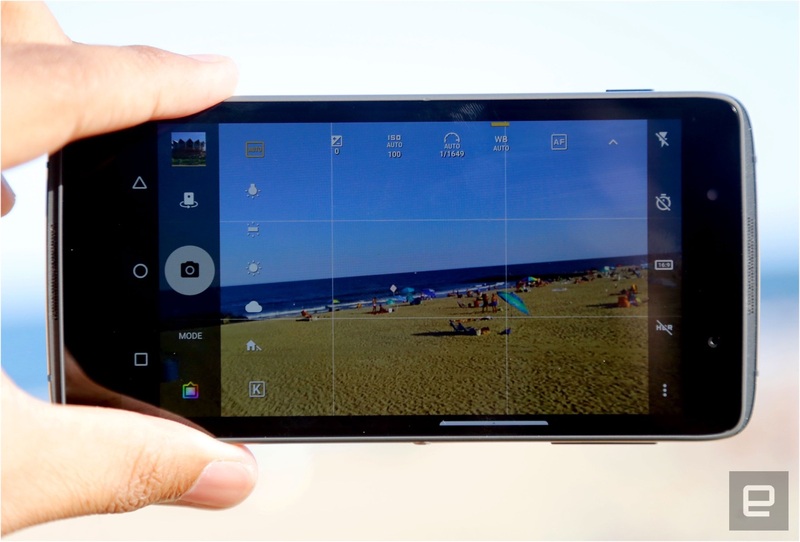 After all, BlackBerry hasn't had the best track record with imaging performance, and on at least one occasion it didn't bother with a camera at all. It turns out that fretting was for nothing: The DTEK50 won't win any photography awards, but both its main and front-facing cameras were respectable performers. That main sensor around back has a f/2.0 aperture lens and a phase-detection autofocus system; too bad it lacks the optical image-stabilization offered on last year's Priv. Even so, my photos contained plenty of detail, with nicely balanced colors in good lighting conditions. Don't expect too much from the DTEK50 in low light; you'll see grain and soft edges everywhere (even after the phone applies it multiframe low-light enhancements). I really shouldn't have been surprised at the DTEK50's performance here -- midrange phones have become more impressive on all fronts, cameras included. That said, I still preferred the photos I took with the similarly priced Moto G4 Plus, which packs a 16-megapixel sensor and an additional laser auto-focus module. BlackBerry still gets some credit for piecing together a good camera app, though. A shutter button lives on the right edge of the screen, with a handy exposure slider, mode selector and a panel of photo filter effects nearby for easy access. More serious photographers will get some mileage out of the included manual mode, which allows for finer control over focus, white balance, shutter speed, exposure compensation and ISO. It's not the most polished camera app, but it's enough to get the job done. This is where things start to get hairy. The octa-core Snapdragon 617 (with four 1.5GHz cores and four 1.2GHz cores) is a well-known chipset at this point and has landed starring roles in phones like the fourth-generation Moto G line and the HTC One A9. For the most part, that combination of CPU cores and 3GB of RAM keep the DTEK50 running without issue. It's certainly not flagship level, but launching apps, multitasking and generally just getting things done generally aren't a problem. Graphically intense games sometimes threw the DTEK50 for a bit of a loop, but I could usually log plenty of time in Asphalt 8 with the visual settings cranked up before noticing any slowdown. Once in a while, though, the phone would start to stutter, even during pretty basic tasks, before eventually returning to normal. I didn't see hiccups this frequently while playing with other 617-powered devices, though that's not to say they were immune to the occasional slowdown. 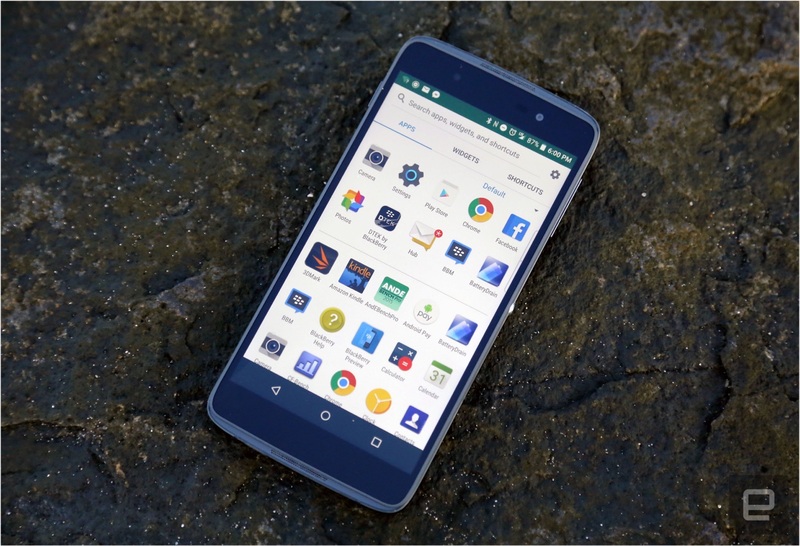 I could usually clear things up by closing all running apps, and I suspect at least sometimes the problem was caused by using the DTEK50 out in the summer heat. Thankfully, these issues didn't crop up every day, and with any luck a post-launch software patch will help smooth things out a bit. The battery, meanwhile, has been awfully hit-or-miss. BlackBerry and TCL fitted the phone with a 2,610mAh nonremovable cell that typically saw me through a full workday and then some before giving up the ghost. That's about 14 hours of pretty consistent, mixed use -- my days involve lots of phone calls, emails, Slack messages and card-slinging in Hearthstone, for the record. That's in line with what we've seen from other midrange phones, which makes the DTEK50's lackluster performance in our standard video rundown test so surprising. The phone looped a 720p video with screen brightness set to 50 percent and WiFi connected for just under eight hours, putting it well below the LG G5 (with a similar size battery) and either of this year's new Moto Gs. In fairness, that's not exactly a natural use case -- I don't know many people who'd watch videos on their phones for eight hours straight -- but it's still sort of a let-down. 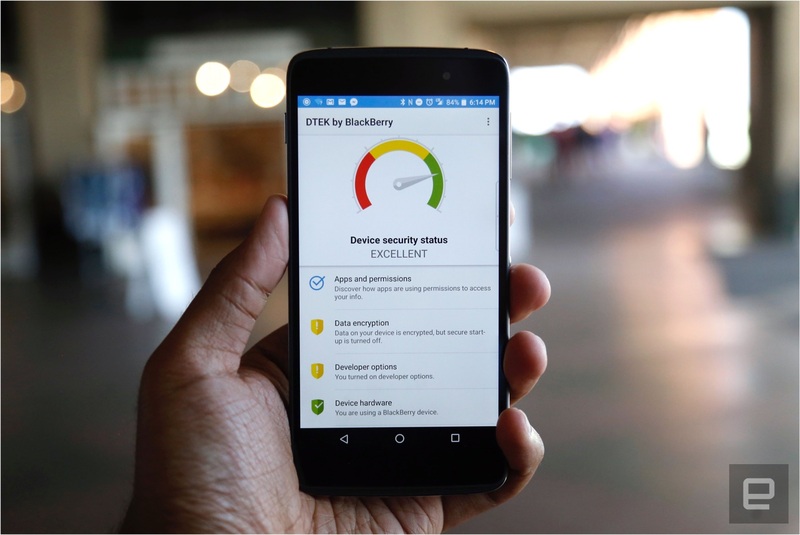 BlackBerry clearly wants to sell tons of DTEK50s to businesses, and among corporate buyers, the company's storied brand and devotion to security might give the phone an edge. The thing is, BlackBerry is trying to sell these to regular people too, and on that front, the DTEK50 faces a much tougher fight. Consider this year's Moto G Plus, an enhanced version of the fourth-generation Moto G that launched alongside it. For $299, you'll get a phone with the same Snapdragon chipset as the DTEK50 but with more RAM (4GB), more storage out of the box (64GB), a better camera (16 megapixels), a fingerprint sensor and an almost-stock version of Android. Motorola's tight focus has wavered a bit -- there are more Moto models now than ever -- but the brand can still put out an excellent cheap phone. The problem is, you could do so much better if you'd be willing to spend just a little more cash. ZTE's Axon 7 and the OnePlus 3 can be had for as little as $399, and they offer full-on flagship performance in impeccably built bodies. None of these options offer the same level of hardened security as the DTEK50, but if you're dead-set on a BlackBerry, you could find a Priv online for around $300. It might be a little older, but the Snapdragon 808 chip inside it is still no slouch, and you'll get a great physical keyboard, to boot. 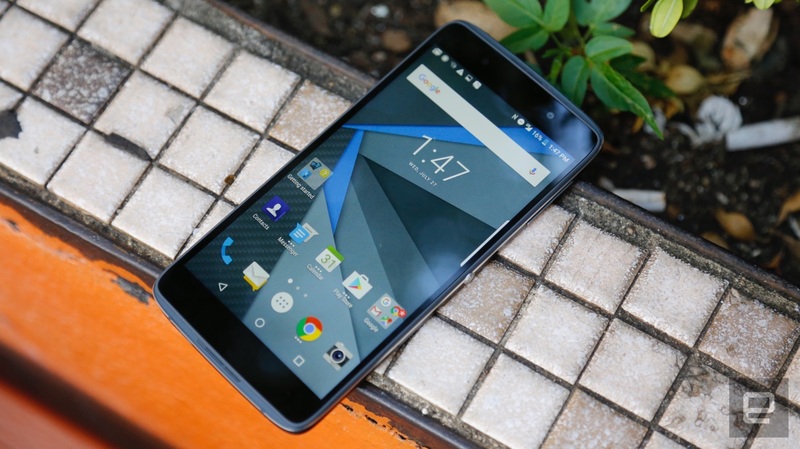 It's been more than a week, and it's still hard to judge the DTEK50. As a ploy to appeal to those crucial business customers, it's brilliant. For them, the DTEK50 is a solid, not-very-expensive option with the security chops to put IT paranoiacs at ease. 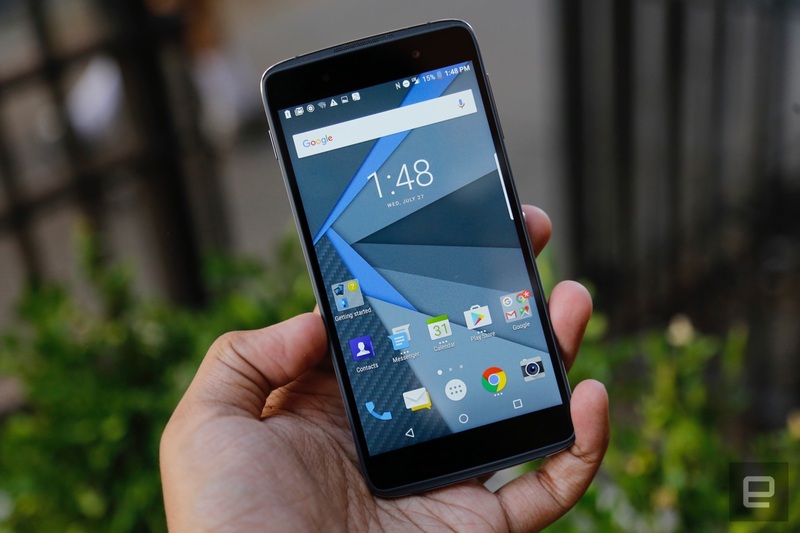 As a phone for regular people, though, the DTEK50 is a much a tougher sell. 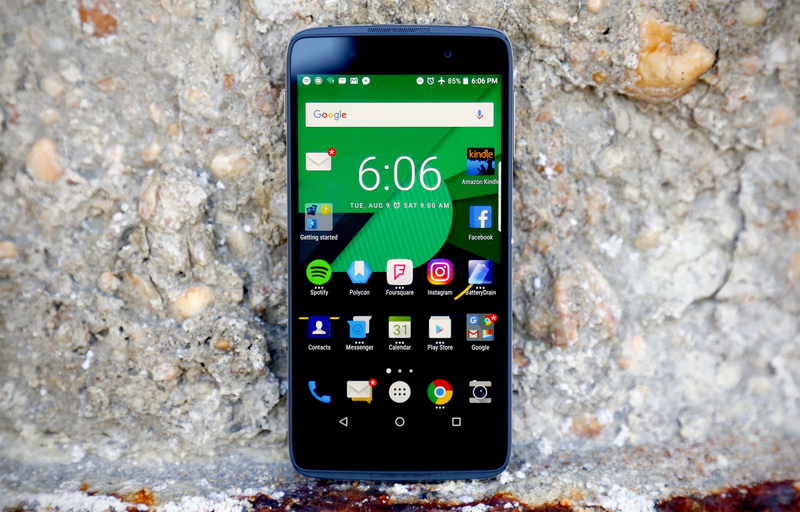 Make no mistake: The DTEK50 is a perfectly good handset, and I'll always appreciate BlackBerry for trying to keep security in the front of people's minds. Still, it takes more than that to make a smartphone great, and BlackBerry's approach won't be for everyone. Unless you're a BlackBerry loyalist or you take your security very, very seriously, you're better off setting your sights elsewhere.